I really like this deck a lot! You might want to consider running Athreos, God of Passage and if you have the funds for it, run Vedalken Orrery . Otherworldly Journey fits your theme, as does Pyxis of Pandemonium . To fit a fate theme, run Fatespinner , Fated Return , Fated Infatuation and Fated Retribution . If you like, have a look at my Moirai deck. I hope these suggestions have been of use to you! So, you need more lands since you aren't playing green and don't have any mana ramp to help you with what is currently in your deck. These are just my suggestions for adding and removing, don't take them to heart. 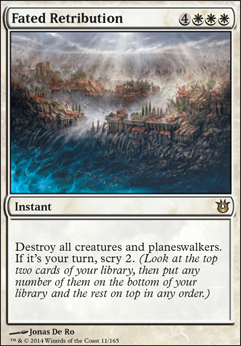 Remembrance: This card actually doesn't do anything in your deck because you don't have Mistveil Plains and don't/can't have any copies of any creatures in your deck. Fated Retribution: If you're aiming for just a boardwipe, Day of Judgment I believe is currently the cheapest 4 drop on the market. If you want instant speed, Terminus gets around indestructible. Caltrops + Light of Sanction & Lightmine Field: I understand the theory/idea for this little synergy you have going here, but all your opponent has to do is get rid of your lightmine field and you won't really be able to attack with any of your creatures since most of them have low toughness. 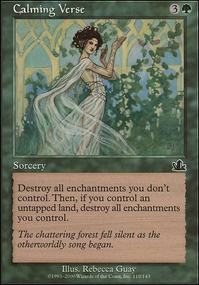 Well of Lost Dreams: You only have four cards in your deck that gain you life so this may see barely any usage. Inheritance, Alms Collector, and Tower of Fortunes can provide possibly more stable draw usage. Contagion Clasp + Contagion Engine : Awesome proliferate cards, sadly these appear to only be the two cards that actually give any permanents any counters and even then the payoff isn't that great when you're looking at the very amount of mana that has to be spent on them. Spy Kit: This gives a creature the same name and not type, so it won't change whatever you equip to a knight. Oh dear lord, just realized this allows you to tutor your whole deck for each non-legendary creature with Remembrance, I mean, if that is the whole reason why you have both of these cards in there, interesting and fun combo for tutoring for any non-legendary creature in your deck, go for it, but I still think there are better cards that will perform more efficiently by themselves. Reliquary Tower: If you possibly put more draw power into the deck based off what I mentioned in Well of Lost Dreams, you want to make sure you are able to keep your hand and not have to discard. Emeria Shepherd: Creature version of the land, but allows you to return it to your hand if you want, and doesn't restrict to creature only. Dolmen Gate: Prevents the combat damage dealt to your creatures. Odric, Lunarch Marshal: Just an all around decent card that shares a few keyword abilities that your creatures have. Boreas Charger: Ramp, it never hurts. Since you also have Blade of Selves and Helm of the Host you can grab yourself more land more often if you go against any sort of deck that ramps/accelerates faster then you. I have had a look at this Oloro deck and I have found somethings which may boost the consistency of your deck. Get rid of Triskedaphobia to begin with - why play it without Tree of Perdition? Insidious Will and Tainted Remedy are worthy of consideration. Furthermore if you wish to be meaner, Worst Fears could be worthy of consideration. Fated Return, Fated Retribution, Shadowmage Infiltrator are three more worthy contestants. You might want to consider a few counter spells. Do any of these help? You wish to have dominance over your opponents right? Why not put in a Telepathy to gauge their every move? Brago, King Eternal needs to be in your main board. But that is just my personal opinion. He is a pain in the patella to get rid of and that is, I believe, what you wish to achieve. Fated Retribution is also a boardwipe to consider. I hope these suggestions help a little! @ForTheOldFrame: Thanks for your upvote and your detailed comment and sorry for posting so late. I was busy the last days and didn't find the time to reply. 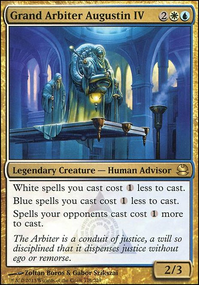 Mentor of the Meek: Is already on my maybe list and goes in the deck as soon as I can get it. Concerted Effort: Is already on my maybe list and goes in the deck as soon as I can get it. But I will probably not build the deck around it. So Lost Auramancers, Plea for Guidance and Windbrisk Heights are out. Especially Windbrisk Heights as my rebels normally only attack once with three creatures or more. Land drops are an issue so Journeyer's Kite and Thawing Glaciers are great choice and I will try them out. Temple of the False God: I tend to have it on my starting hand nearly every time I play it in a deck. So I am not a big fan of this card. But with Journeyer's Kite and Thawing Glaciers it is maybe worth a try. Sword of the Animist: Mostly I need my rebels to control the table and don't have a chance to attack the first rounds. 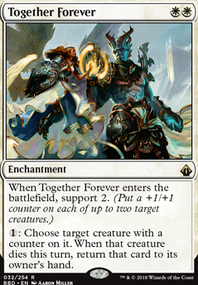 Rebels mitigate the lack of good carddraw in white by tutoring for your creatures. 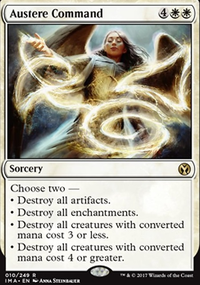 Normally I tend to keep 4-6 cards in my hand and use my mana to tutor for rebels or recast Lin Sivvi, Defiant Hero so I don't need Jayemdae Tome, Armistice or Slate of Ancestry. Especially the later I think is not a good option with rebels. If you have enough rebels on the field you normally search for Mirror Entity and attack with your army. Light of Day synergices very well with Scuttlemutt and Distorting Lens so I will try it out. Fated Retribution is not the only instant wrath in white. There is also Rout. And I think if I add Cataclysm I am fine with wrath effects. Catastrophe and Armageddon are good option, but as I mostly play casual I leave them out. Cessation is better than Pacifism but at the moment Pacifism is only a placeholder and will get out of the deck. Presumable for an other suggestion form you. My playgroup mostly plays with older cards and so we decided to ban all planeswalkers. 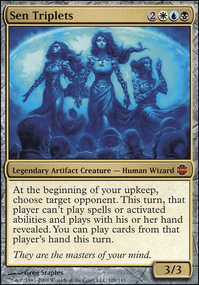 So Elspeth Tirel and Gideon of the Trials are out for me. Angel's Trumpet is a good card but not in my build, I think it is possibly in rebels but you have to build the deck differently. The runes cycle: Great suggestion. As rebels have already good answers against red and black I will try to find room for the three other runes. Icatian Store: I don't like the old storage land and I think that Fountain of Cho is strictly better. But normally I need my mana every turn and not a lot of mana in one turn. The only exception is Mirror Entity so I think I don't need it. But maybe I will try it out some day. 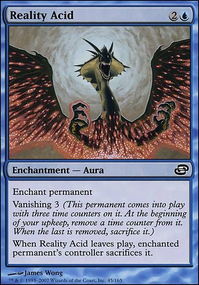 Kongming, "Sleeping Dragon": For mone white Benalish Marshal is better and I will get one for this deck. Elesh Norn, Grand Cenobite is great but to expensive (money) for me. Pariah and Pariah's Shield: I think you are right and the runes are better suited for the deck.